For high-accuracy GIS data collection and asset relocation, the Trimble® GeoXH™ handheld is the perfect integrated solution. Engineered with Trimble H-Star™ technology, the GeoXH handheld delivers decimeter (10 cm / 4 inch) to subfoot (<30 cm) accuracy when you need it, making it the ideal device for electric and gas utilities, water and wastewater services, land reform projects, and other applications where on-the-spot positioning is crucial. 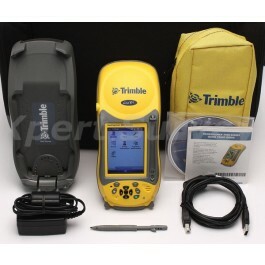 The GeoExplorer® 3000 series combines a Trimble GPS receiver with a rugged handheld computer, built for all-day use and packed with connectivity options. Technology this clever has never been more convenient. When your GIS database requires the highest levels of accuracy, the GeoXH handheld is the answer. Using revolutionary Trimble H-Star technology, the GeoXH handheld delivers real-time subfoot accuracy with the internal antenna, and decimeter accuracy with an optional Trimble Tornado™ external antenna. Back-office data processing is eliminated, streamlining asset inventories and as-built mapping jobs. Need to relocate assets in the field? The GeoXH handheld has you covered. Buried and hidden assets can be tracked down with ease, as the real-time high accuracy gets you straight to the point. Cables and pipes can be excavated without wasted effort or risk of damage to nearby assets. When you postprocess with Trimble office software you can be confident of achieving decimeter level accuracy with greater consistency at longer baselines, in tougher environments, and with shorter occupations. With a powerful 520 MHz processor, 128 MB RAM, and 1 GB of onboard storage, the GeoXH handheld is a high performance device designed to work as hard as you do. The handheld gives you all the power you need to work with maps and large data sets in the field, and its high resolution VGA display allows for crisp and clear viewing of your data. The GeoXH handheld is powered by the industry-standard Windows Mobile® version 6.1 operating system so you can choose a software solution designed for your field requirements, whether off-the-shelf or purpose-built. With the GeoXH handheld you have the flexibility to work exactly the way you want to. Use the built-in wireless LAN connection to access your organization’s secure network and get the most up-to-date information. You can also wirelessly connect to other devices such as Bluetooth®-enabled laser rangefinders and barcode scanners for convenient cable-free solutions that keep you productive in the field. Cellular connectivity can be added to the GeoXH handheld via the TDL 3G cellular modem. Connecting via wireless LAN or Bluetooth, the TDL 3G provides continuous network/internet access to real-time map data, webbased services, Trimble VRS™ corrections, and live update of field information. The GeoXH handheld has an integrated battery, good for a full day’s work; simply charge the battery overnight and you’re ready to go again. The GeoXH handheld will last the distance, and its rugged design can take a lot of punishment. Rain, hail or shine, it’s built to keep working, whatever the weather throws at you. Rugged design and powerful functionality are the hallmarks of the GeoExplorer series. And now with H-Star technology providing decimeter to subfoot accuracy in real time, the 3000 series GeoXH handheld is your ultimate solution for high-accuracy asset management. When accuracy is critical, the GeoXH handheld delivers—with unprecedented efficiency and reliability, when and where you need it.